Amazon is sunsetting its popular Mayday feature, which let Kindle Fire tablet owners access live tech support by pressing a button on their devices. Now, we’re all going to have to phone or email customer support just like we used to in the olden days. What Was the Amazon Mayday Button? 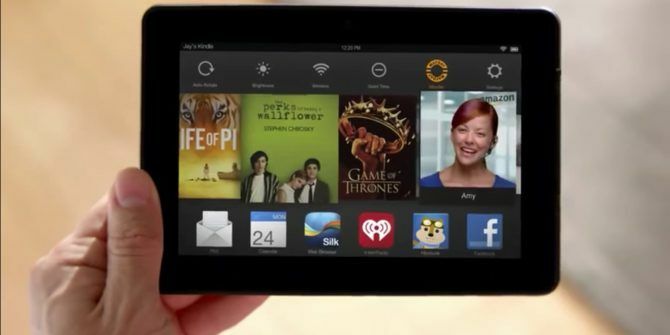 The Mayday button was a feature on Amazon Fire devices. This was a literal button which users could press to summon live tech support. Which would be a human being you could see on your tablet offering to help you solve any issue you were having with your device. Amazon was rightly proud of this innovation, and it was one of the few features to differentiate Amazon Fire tablets from the competition. And users loved the Mayday button, with a reported three-quarters of Fire HDX owners using it in the first year. Amazon unveiled the Mayday button in 2013, but the company has been quietly shuffling it to one side ever since. Recent products haven’t even included the Mayday feature, meaning the end has been nigh. And now, in June 2018, it’s being killed off completely. While the Mayday video calling service is no more, Amazon is still offering Mayday Screen Sharing. This means that once you have contacted customer service, you’ll be able to share your screen with Amazon to help them offer technical support for your device. While it’s disappointing to see an innovative feature such as Mayday video calling die, it is understandable. Paying support staff to be on call isn’t cheap. Which is probably why Amazon lets Alexa take care of most of its customer support. If you have read this far through this article then we would hazard a guess that you own an Amazon Fire tablet. In which case you should make sure to check out our unofficial Amazon Fire tablet manual Your Unofficial Amazon Fire Tablet Manual Your Unofficial Amazon Fire Tablet Manual The Amazon Fire tablet is a great alternative to the basic E-Ink Kindle e-readers, while offering compelling new features more akin to a tablet. Its small size and flexibility makes it the top choice. Read More and these awesome Amazon Fire tablet tips 8 Amazon Fire Tablet Tips You Must Try 8 Amazon Fire Tablet Tips You Must Try Your Amazon Fire tablet can do a lot! Get the most out of it with these tips and tricks. Read More . Explore more about: Amazon, Amazon Kindle Fire, Tech Support, Video Chat / Call. iPhonetracer.com - these guys can help you track/find a lost/stolen iphone using IMEI or Serial number if needed and if nothing else helps. What they do is track an iphone via IMEI or Serial number, you will need to have it on hand - you can find it on the box from your stolen/lost iphone. They helped me to find my stolen iphone by IMEI and I got it back using their information and reports. They send very useful information.